Turkish yard Vicem Yachts has announced the sale of a new Vicem 65 Classic motor yacht to an American owner. 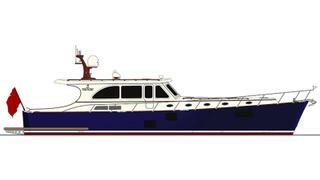 The 20.32 metre yacht will be the owner’s second Vicem and will have a beam measuring 5.69 metres. The owner, who intends to cruise his new yacht from his home port in Newport, Rhode Island, worked closely with the yard’s in-house designers “to create the boat of his dreams,” Vicem said. This includes a three-stateroom layout, with the crew’s quarters located aft, in a mahogany finish. A spacious saloon will be surrounded by “large expanses of glass” and will include an L-shaped settee starboard for family dining or cocktails. The helm station will be located forward and also constructed in mahogany. The saloon is accessible from the cockpit, which will include another L-shaped settee and mahogany dining table inlaid with a compass rose. The cockpit will also feature coolers, a wet bar and sink, refrigerator and storage space. The master stateroom will be set forward while two guest doubles will sit aft, opposite the port side galley. Both will be en suite. The yacht, which will be constructed from a cold moulded hull, will be fitted with twin 900hp Volvo Penta D13s for a top speed of 26 knots.